Since class diagrams are used for many different purposes, such as making stakeholders aware of requirements to highlighting your detailed design, you need to apply a different style in each circumstance. This section describes style guidelines that are relevant to various types of class diagrams. - Design class diagrams should reflect language naming conventions. In the “Analysis and design version of a class” image you see that the design version of the Order class uses names that conform to common Java programming conventions such as placementDateand calculateTaxes(). - Model association classes on analysis diagrams. 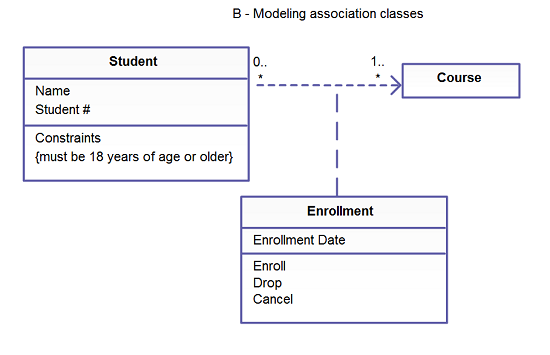 The image that shows the “Modelling association classes” indicates the association classes that are depicted as class attached via a dashed line to an association – the association line, the class, and the dashed line are considered one symbol in the UML. - Do not name associations that have association classes. - Center the dashed line of an association class. A class is basically a template from which objects are created. Classes define attributes, information that are relevant to their instances, operations, and functionality that the objects support. Some of the more important guidelines pertinent to classes are listed down below. Indicate exceptions in an operation’s property string. Exceptions can be indicated with a UML property string, an example of which is shown in the above image. An interface can be defined as collection of operation signature and/or attribute definitions that ideally defines a cohesive set of behaviors. 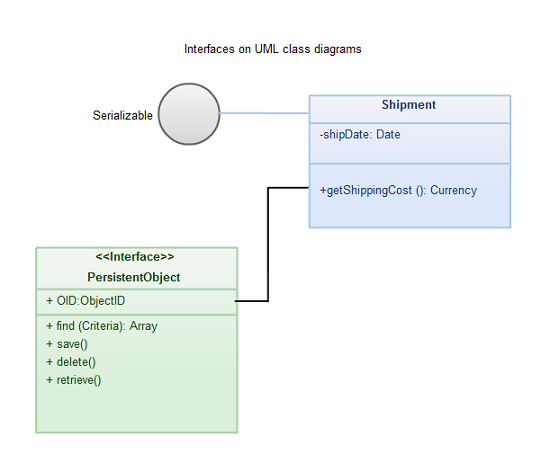 Interfaces are implemented, “realized” in UML parlance, by classes and components. In order to realize an interface, a class or component should use the operations and attributes that are defined by the interface. Any given class or component may use zero or more interfaces and one or more classes or components can use the same interface. Interface definitions must reflect implementation language constraints. In the above image, you see that a standard class box has been used to define the interface PersistentObject (note the use of the <<interface>> stereotype). As it is known an object is made up of other objects. If you were to consider as examples where an airplane consists of wings, a fuselage, engines, flaps, landing gear and so on. A delivery shipment would contain one or more packages and a team consists of two or more employees. These are all examples of the concept of aggregation that illustrates “is part of” relationships. An engine is part of a plane, a package is part of a shipment, and an employee is part of a team. Aggregation is a specialization of association, highlighting an entire-part relationship that exists between two objects. Composition is a much potent form of aggregation where the whole and parts have coincident lifetimes, and it is very common for the whole to manage the lifecycle of its parts. If you were to consider a stylistic point of view, aggregation and composition are both specializations of association where the guidelines for associations do apply. Inheritance models “is a” and “is like” relationships, enabling you to rather conveniently reuse data and code that already exist. When “A” inherits from “B” we say that “A” is the subclass of “B” and that “B” is the superclass of “A.” In addition to this, we have “pure inheritance” when “A” inherits all of the attributes and methods of “B”. The UML modeling notation for inheritance is usually depicted as a line that has a closed arrowhead, which points from the subclass right down to the superclass. At this particular juncture, the term “relationships” will encompass all UML concepts such as aggregation, associations, dependencies, composition, realizations, and inheritance. In other words, if it’s a line on a UML class diagram, it can be considered as a relationship. The following guidelines could be considered as “best practices” and and effort should be made to adhere to them at all times. Depict similar relationships involving a common class as a tree. In Figure A you see that both Delivery and Order have a dependency on OIDGenerator. Note how the two dependencies are drawn in combination in “tree configuration”, instead of as two separate lines, to reduce clutter in the diagram. Replace relationships by indicating attribute types. 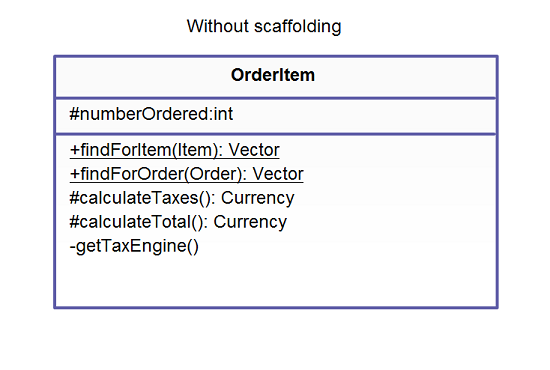 In Figure C you see that the customer has a shippingAddress attribute of type Address – part of the scaffolding code to maintain the association between customer objects and address objects. Make associations bi-directional only when collaboration occurs in both directions. The lives at association of Figure B is uni-directional.